In answer to George Washington’s letter (see previous post) HARRIOT WASHINGTON thanks him for his advice and promises to learn to be a help to her cousin Fanny Bassett Washington, the wife of George Washington’s nephew, George Augustine Washington, in running the household. In a subsequent letter Harriot again requests a “guittar”. Mt Vernon May 28 1792I now take up my pen to write to my dear Uncle, I hope you arrived safe in Philadelphia, and at the time you exspected, If my dear Uncle finds, it convenient to give me a guittar, I will thank you if you will direct it to be made with key’s and string’s both, as they are easier to lear[n] to play on, and not so easy to be out of order, but if one with key’s, is dearer than without, I shall be much obleiged to you for one with string’s, I should not trouble you for a guttar, if I was not certain that I could learn myself, every person that I have asked say’s that It is the easiest instrument to learn on that is, and any body that can turn a tune, can play on a guittar, but Mrs Bushrod Washington, has been so kind as to offer to teach me if I could not learn myself. Washington acceded to Harriot’s wishes this time. On June 27 he paid $17 for a guitar for her. (From Decatur, Private Affairs of George Washington, 273, quoted in source cited below.) Bushrod Washington was the son of George Washington’s brother John Augustine. 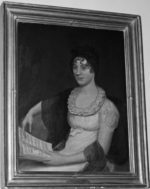 His wife was Julia Ann Blackburn whose portrait (above) by Chester Harding hung in the JFK White House; it was photographed by Robert Knudson. Bushrod inherited Mount Vernon upon the death of Martha Washington.